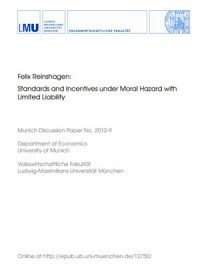 We consider amodel of moral hazard with limited liability of the agent and effort that is two-dimensional. One dimension of the agent’s effort is observable and the other is not. The principal can thusmake the contract conditional not only on outcome but also on observable effort. The principal’s optimal contract gives the agent no rent and – in contrast to the first-best allocation – uses toomuch observable effort and too little unobservable effort. This distortion in the relative use of the two kinds of effort increases if the agent’s liability becomes more limited.